This entry is part 8 of 8 in the series French Guiana. 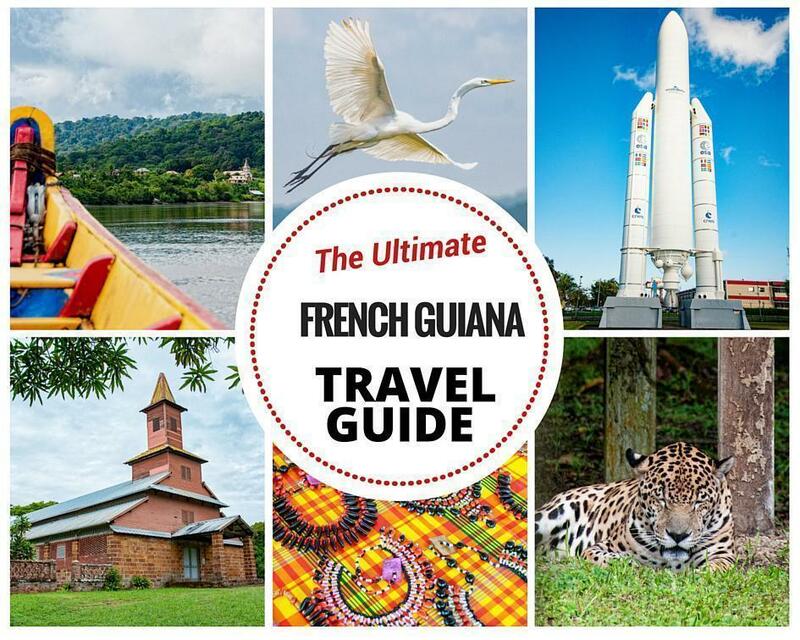 Today we share our ultimate guide to travel to and in French Guiana, so you have all the information you need to plan your travel to the French Amazon! Over the past month, I’ve been sharing articles about my incredible week in French Guiana. I fell head-over-heals for this French Overseas Territory in South America. It’s a surprising place, and I had a lot of misconceptions about Guyane before I visited. Luckily, I spent my week with an amazing local guide, who answered my endless questions about her fascinating region. 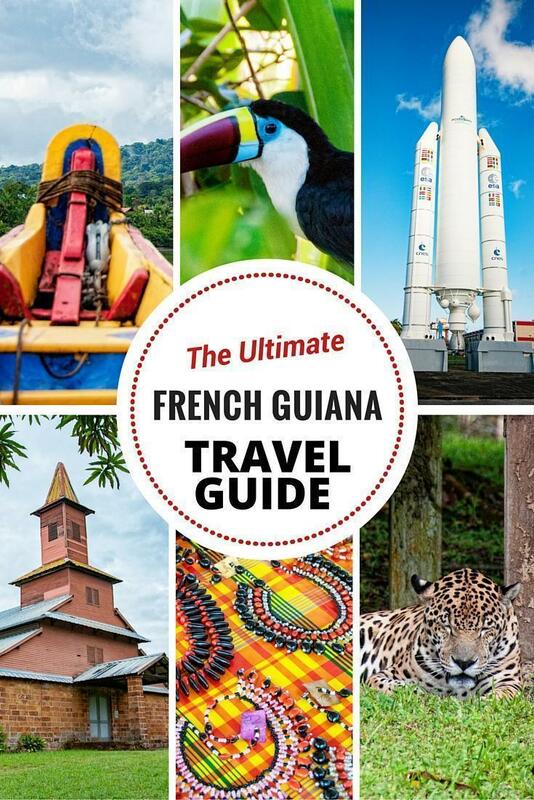 Today I’d like to share what I learned in my Guide to French Guiana, so you have all the information you need to plan your own trip. 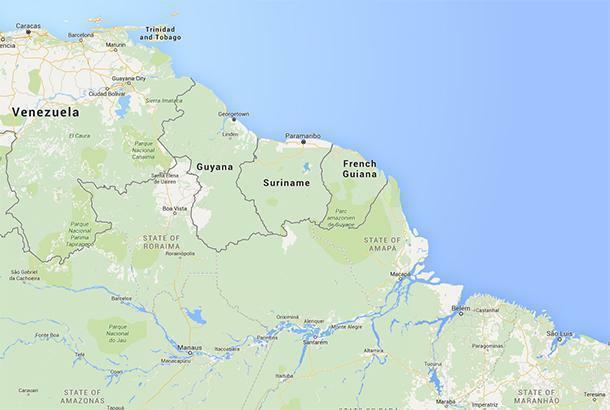 Where and What is French Guiana? French Guiana (Guyane in French) is not a country, but a French Overseas Territory; the only European territory remaining in South America. It is located to the north and east of Brazil and south of Suriname (formerly Dutch Guiana). It has a long stretch of Atlantic coast and is almost entirely separated from its neighbours by rivers. Much of the country, beyond the coast, is covered in dense Amazonian rainforest. Being a French territory, the official language is French, which is taught in school and used for all government functions. However, French Guianese Creole is widely spoken among the people. four Maroon (descendants of African slaves) dialects: Saramaka, Paramaccan, Aluku, and Ndyuka. There is a population of Hmong, originally from Laos, who speak Hmong Njua. From immigration and commerce with neighbouring countries, Portuguese, Hakka, Haitian Creole, Spanish, Dutch and English are also spoken. English however, is last for a reason. It is not widely spoken in French Guiana and little tourism information in English is available at this time. Currency in French Guiana is the Euro. This makes it more expensive to visit than neighbouring countries, but also makes it easy for European travellers to visit. Prices for food and accommodation are high for South America, but low compared to Europe. French Guiana uses a European standard type C and F plug so European electrical appliances will work without adaptors. If you are visiting from North America, you will need a European adaptor for your electronics. Who Should Visit French Guiana? 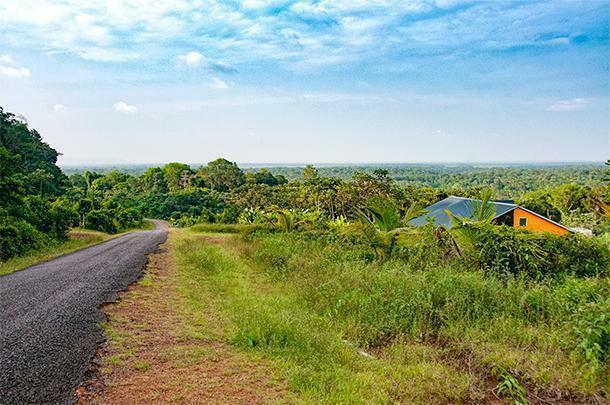 If you love nature and destinations unspoiled by over-development, French Guiana is for you. If you enjoy hiking, boating, and other outdoor activities, you will find plenty to do in French Guiana. French Guiana is also perfect for people who enjoy close contact with diverse cultures; fresh, local foods; and science buffs who wish to visit the Guianese Space Centre and maybe even experience a rocket launch. Who Shouldn’t Visit French Guiana? If you are only comfortable visiting places where English is spoken, French Guiana is not a good choice. Similarly, if you prefer large-scale, all-inclusive beach resort accommodation, you won’t find what you’re looking for in French Guiana. For flights to French Guiana, there’s good news and bad news. If you live in Europe and can get to Paris easily, there’s good news. Direct flights, with Air France, from Paris to Cayenne can be incredibly cheap. Like all French Overseas Territories, flights to French Guiana are subsidised by the government. If you book in advance and are flexible with your dates, you can fly from Paris to Cayenne for less than most North American destinations. The flight takes 8.5-9 hours and is an easy way to get to South America. If you don’t live in Europe and can’t get to Paris easily, the news is not so good. The only direct flights fly from the following places: Martinique, Brazil, Dominican Republic, Guadalupe, Puerto Rico, and Suriname. The ‘best’ prices generally have you routeing through Paris… to fly back to South America. If you are comfortable with hunting down your own flights, you can score deals to fly to the Caribbean and then on to French Guiana. There are also overland (actually ferry) borders between Suriname and Brazil to French Guiana. However, the infrastructure in those border areas isn’t great, and getting to them can be more complicated than flying via Paris if you aren’t already in South America. A car is essential if you are travelling independently around French Guiana. Rental cars are available at the airport and major cities. There is one main highway along the coast and good infrastructure around Cayenne and the coastal cities. However, as you start to head inland, roads become more scarce and in worse condition. All of the places I visited during my week-long stay, we accessed by car. Distances are relatively long, but the driving is easy, except during the freak rainstorms, when visibility is non-existent. Public transportation exists, in theory, but it is infrequent and unreliable. There is a wide range of accommodation in French Guiana, to suit just about every need and budget. 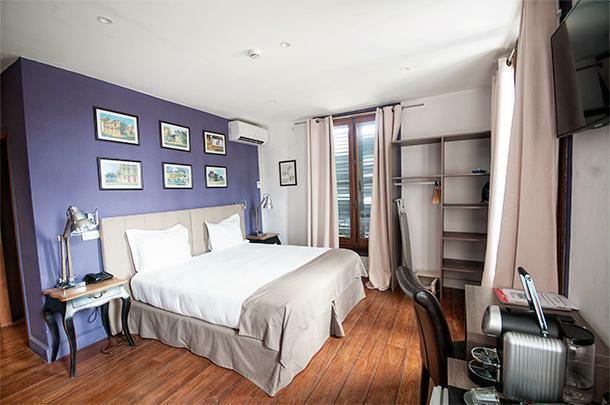 You can rent a room from a local family for a few euros, or stay in a high-end hotel with all the amenities. 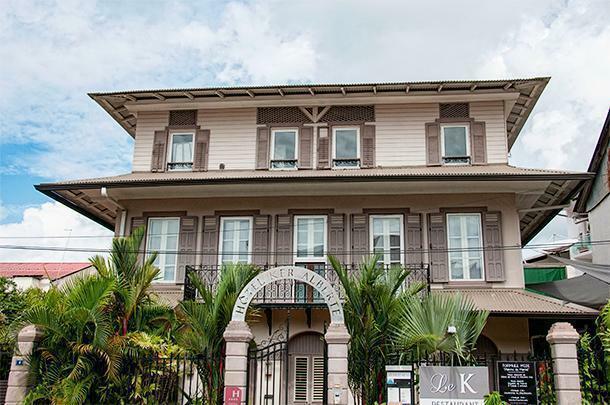 For a complete look at all of the hotels, I stayed in during my time in French Guiana, read my article on Where to Stay in French Guiana. 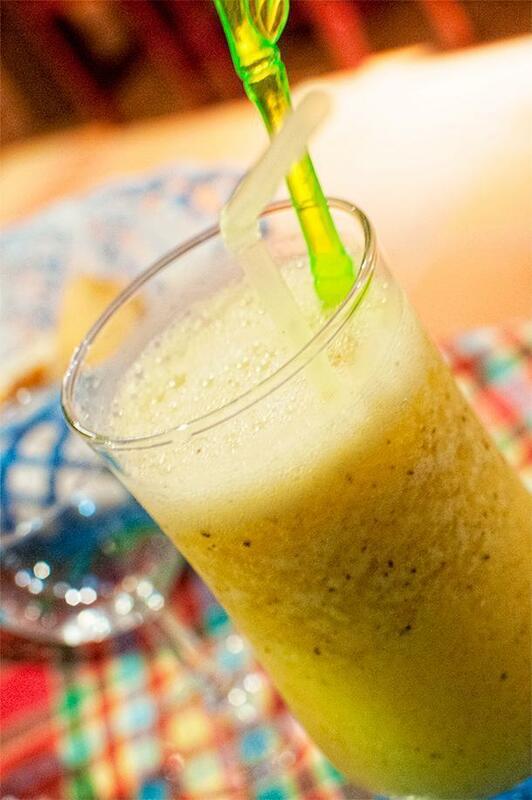 French Guiana is perfect for foodies. There are diverse cuisines and plenty of exotic fruits. Dining options range from food trucks and street food all the way to fine dining. 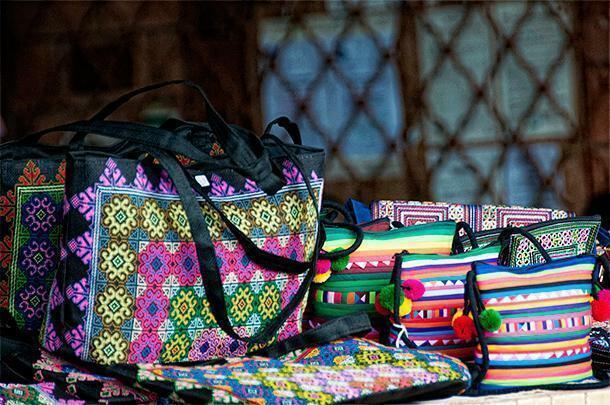 You can have a breakfast of exotic jungle fruits, lunch on Hmong Soup and a dinner of haute-cuisine Creole dishes. 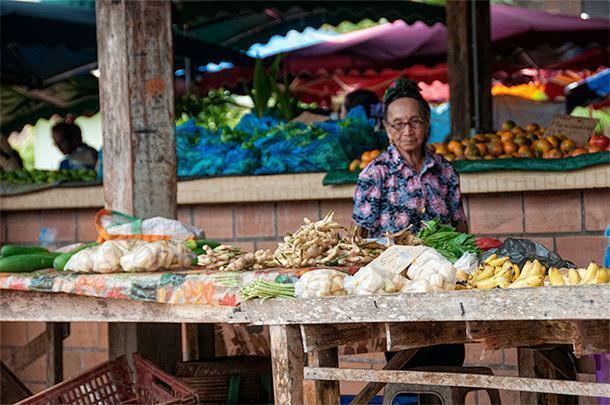 Read our full article for everything you need to know about food in French Guiana. Drinking water is safe and clean and meets French standards; however, most good hotels and restaurants will offer bottled water. The local water, Dilo, is cheap and delicious and what I drank, primarily, throughout my stay. 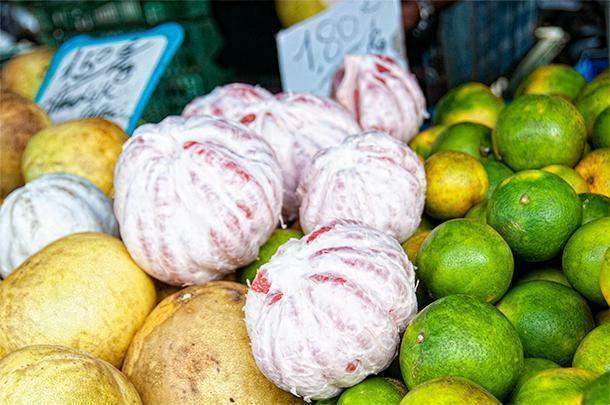 It would be a crime to visit French Guiana without enjoying the abundance of fresh fruits and vegetables. Take normal precautions when washing your food, but remember that it’s just as safe to eat fresh food in French Guiana as it is anywhere else in France. 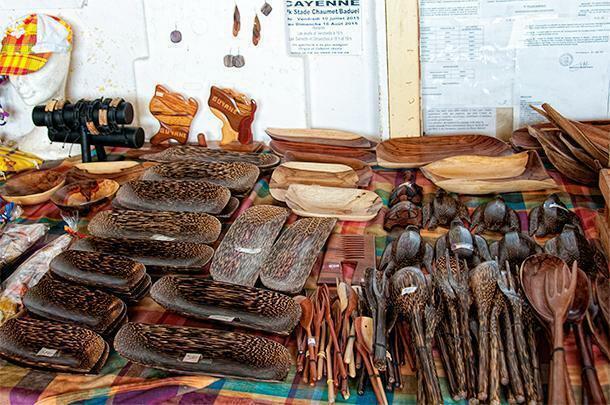 You can shop for plenty of unique souvenirs in French Guiana, from intricate carvings in a variety of colourful woods, jewellery made from seeds harvested from the jungle or from butterfly wings, hand-sewn items made by the Hmong people, pottery, woven items and baskets made by Amerindian tribes, and much more. 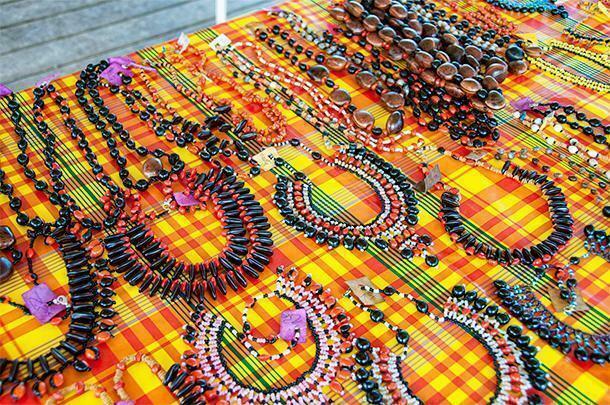 Gold and Silver jewellery is also more affordable in French Guiana, and there are a number of excellent shops in Cayenne. 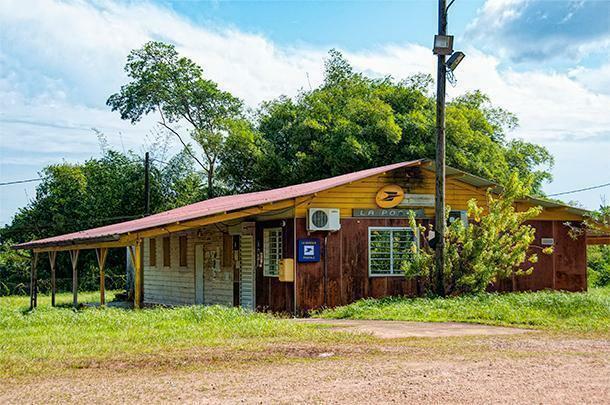 Even tiny Cacoa village has a post office, of sorts. Infrastructure in French Guiana varies widely depending where you are in the country. Around Cayenne, the roads and signage are as good as anywhere in France. You’ll also find many of the same large chain stores in the business park. Like France, all communities have a local government building, post-office, police, etc. But again, these vary from large city institutions to tiny one-room wooden buildings, in rural villages. One major hurdle for potential visitors to French Guiana is concerns about health. This is largely due to the requirement for a Yellow Fever vaccine. Vaccination papers must be shown even before boarding a flight to French Guiana, leading people (myself included before visiting) to believe Yellow Fever is rampant in the territory. This is not the case. Yellow Fever is rare and generally limited to rural areas, with few reported cases in recent years. However, for the time being, you still need to visit an International Vaccine Centre for your Yellow Fever vaccination before travelling to French Guiana. Like all tropical regions, diseases like malaria and Dengue Fever are also a risk, but typically not in the areas most tourists visit. Care should be taken to protect yourself against mosquitoes, particularly if you are in the jungle, however, don’t panic. Despite covering myself with clothes and bug spray, I still managed to be feasted on by mosquitoes and am happy to report I came home as healthy as I was when I left for Guyane. My ‘uniform’ in French Guiana was light, long-sleeved tops and leggings or linen pants. French Guiana is hot and humid. I visited in mid-July and temperatures reached close to 40°C most days. The humidity is almost 100%. Pack light, breathable clothes but make sure they keep you covered to avoid direct sun exposure and to help protect you from mosquitoes. They don’t call it the rain forest for nothing. When it rains in French Guiana, it pours so be sure to take rain gear, preferably light, breathable items like ponchos that you can stuff in your bag and carry with you. The humidity (and rain) is hell on electronics. A dry bag to keep your camera and other gear safe is a good idea. Comfortable walking shoes. I used hiking sandals for my entire trip, however, if you plan to do heavier hiking in the jungle, be sure to take good hiking boots. 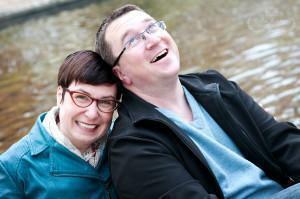 An open mind, an empty stomach, and a smile. The people of French Guiana are friendly, warm and ready to feed you! I was given two excellent guidebooks to prepare me for my trip. Both are in French. I have been able to find little *good* information in English, which is one of the main reasons I wrote this guide. If you do read French, I highly recommend the following books. Like this travel guide? Save it to Pinterest!